It’s six years later now and Yashasvi Jaiswal is 17 years old, a middle-order batsman with remarkable temperament and is ready to join the India Under-19 team for the Sri Lanka tour. For three years, he lived with groundsmen in the Muslim United Club’s tent at the Azad Maidan ground in Mumbai. He had to, after he was thrown out of a dairy shop where he used to sleep. Yashasvi Jaiswal was just 11 years old then and the only thing that kept him going was a dream — to play cricket for India. The younger of two sons to a small-time shopkeeper in Bhadohi in Uttar Pradesh, Jaiswal moved to Mumbai to pursue cricket. His father did not object since he found it hard to feed the family. An uncle, Santosh, in Mumbai, had a house in Worli, but it wasn’t big enough for another occupant. Santosh had requested the owners of Muslim United Club, where he was a manager, if the boy could stay in the tent. “This was after I was asked to leave the dairy at Kalbadevi. After playing cricket the entire day, I would get tired and go to sleep. One day, they threw out my luggage saying I do nothing, don’t help them and only sleep,” says Jaiswal. For three years, that tent became his home. 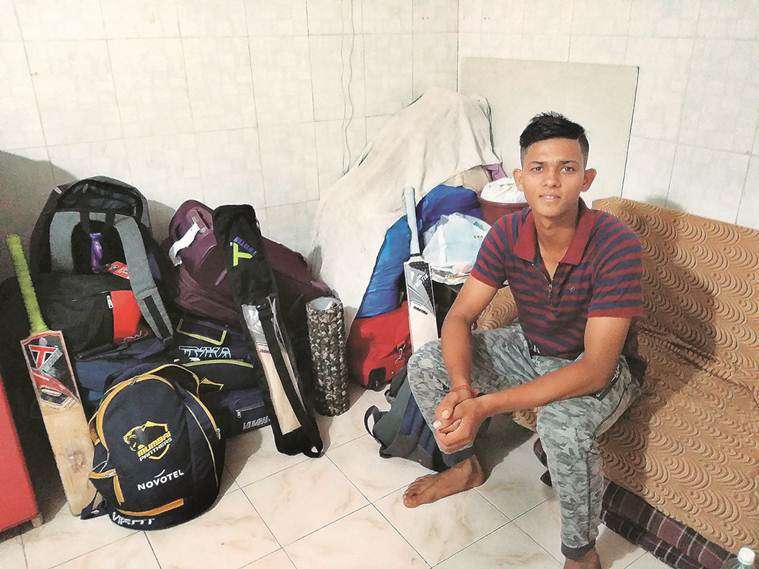 The teenager took pains to ensure that stories of his struggles never reached Bhadohi, as that would end his cricketing career. Occasionally, his father would send some money but that was never enough. He had to sell pani-puri during the Ram Leela in Azad Maidan and help sell fruits. But there were still days when he would go to sleep on an empty stomach as the groundsmen with whom he shared the tent fought with each other. Without them cooking, he would drift off with just dreams lulling him to sleep. “During Ram Leela, I earned well. I prayed that my teammates would not come there for pani-puri. Sometimes they did and I would feel bad serving them,” he says. He tried his best to keep some money coming in. He would score and play games with older boys to earn Rs 200-300 to survive a week. “I always used to see boys my age bringing food or their parents had big lunches with them. As for me, it was — khana khud banao, khud khao. (make your own food, eat alone). No breakfast. Catch hold of anyone around and request them to buy breakfast,” he recalls. The days were fine, he recalls, since he was busy scrounging around for work and cricket, but the nights sometimes were too long. “I would miss my family and would cry. It was not just being homesick but going to the toilet was a hindrance to sleep. There was no toilet at the maidan, and the one near Fashion Street that I used was closed at night,” he says. Mumbai U-19 coach Satish Samant says Jaiswal will be the next big Mumbai player. “He has this ability to read a bowlers mind and adapt to a situation. Most under-19 players get tempted to play too many shots too early. He does not. The other thing is, he does not have a smartphone, is not on WhatsApp. This is rare for a teenage cricketer these days. He is cut off from social media. He has talent and if he keeps focus like this, he will be next big from Mumbai player,” says Samant. Before he got picked for Mumbai the U-19 squad, the Azad Maidan was abuzz with stories of the talented young batsman who needed support. Things turned around when a local coach Jwala Singh met him and took him under his wing. An immigrant from UP himself, Jwala saw his early childhood in Jaiswal. “He must have been around 12 years and I saw him facing an ‘A’ division bowler with ease. I could relate to him. When I also came to Mumbai from UP, I didn’t have a house to stay in. No godfather, no guide. He is gifted. He has 49 centuries in the last five years,” says Jwala, who has played the junior age group for Mumbai and had a stint at the MRF pace foundation along with Zaheer Khan. Jaiswal now stays in a small chawl in Kadamwadi, which he calls his palace. “Have you ever stayed in a tent? I bet you can’t stay one day there in summers. It gets very hot, sir. The heat generated by plastic is unbearable. We would often take our sheets and sleep on the open ground. Once, an insect bit me near my eyes and it was swollen. After that, despite the heat, I slept inside,” he says. Asked about the pressures of higher-grade cricket, he scoffs. “You are talking about mental pressure in cricket? I have faced it daily in my life for years. Those have made me strong. Scoring runs is not important. I know I will score and take wickets. For me, whether I get the next meal or not, that’s important,” he says.